The defending Pacific Division champions could be trending down this season, so fantasy players might want to take a buyer-beware approach to picking Anaheim Ducks. The usual suspects are still worthy of roster spots, but those core players aren’t getting any younger and may not be as productive as years past. They have been proven performers and go-to guys for a decade now — in real life and in fantasy — so they deserve to be on draft lists, perhaps just a little lower than history would dictate. Drop them a round or two and consider them more as complementary pieces going forward. There is also the Randy Carlyle factor and whether the return of Anaheim’s former head coach will help or hurt their fantasy value. And it remains to be seen whether any of the younger Ducks will be capable of picking up the slack should those veterans take a step back. Several players will need to step up — and that includes their fantasy stat-lines — for Anaheim to be a playoff team again. 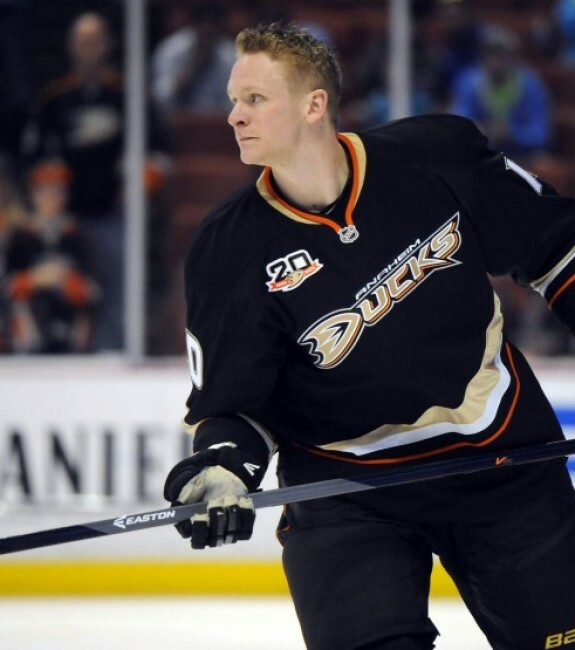 Corey Perry is 31 years old now and plays a rugged style that could cause him to start slowing down this season. His best years are probably behind him, but Perry remains a strong fantasy asset. He’s one of those core guys, but Perry should continue to be Anaheim’s top fantasy option, especially in multi-stat leagues that count shots, hits and penalty minutes. Perry has long been a beast in those formats and he’ll be an all-around contributor again — even if his goal and point totals dip a bit. For points-only leagues, Perry probably shouldn’t be a first-round pick this season. Anticipating more than 30 goals and/or 60 points from Perry would be setting yourself up for disappointment. Temper those expectations to the 25-goal, 55-point range and and you could be pleasantly surprised at season’s end. Play it safe and rank Perry right around 40th overall for standard leagues or closer to 30th if those extra categories come into play. He’s not the first defenceman that comes to mind on draft day, but Vatanen tends to outperform some of the bigger names typically taken ahead of him. Last season, Vatanen finished 29th among all defence scorers with 38 points in 71 games and he could have been closer to the top 20 had he played all 82 games — his stat-line prorated to 44 points, which would have tied for 19th. sami vatanen was the biggest steal of a pick in all my pools. Vatanen is very capable of 10-plus goals and 40-plus points this season and should once again be a key player on Anaheim’s power play. He’s not a No. 1 option for fantasy teams, but Vatanen is a quality No. 2 or 3 depending on the depth of your league. Keep in mind, Vatanen projects as a better pick than Niklas Kronwall, Zdeno Chara, Dion Phaneuf and Jay Bouwmeester, among others on the down slope. Speaking of the down slope, Kesler is entering the first season of a six-year extension that has future buyout candidate written all over it. Granted, he might be good for another 20-goal, 50-point season, but Kesler is sure to go higher than he should in most drafts. Reason being, he’s still riding that name value from his Vancouver days. In the present, Kesler will continue to serve a purpose for the Ducks — he wins faceoffs, is defensively responsible, capable of playing a shutdown role, and brings leadership — but none of those intangibles are going to help your fantasy team. Well, except for the rare leagues that reward his ability in the face-off circle. Realistically, Kesler should no longer be ranked in your top 100. It’s looking like he’ll get a chance to play on a scoring line unless the Ducks find the cap space to sign another left-winger or decide to trade a defenceman for an upgrade there. As it stands, Ritchie could be gifted a prominent role at least to start the season. If he ends up flanking Perry and Ryan Getzlaf, Ritchie would be an opportunistic fantasy option. Nick Ritchie could be a fantasy sleeper this season, as long as he sticks on a scoring line for Anaheim. The 10th overall pick from 2014 only managed two goals and four points in 33 NHL games as a rookie last season, so he probably won’t be on the radar for most of your draft peers. Not unless there is a buzz around Ritchie during training camp or he lights it up in the preseason. He has yet to do much in the NHL, but Ritchie did put up 16 goals and 30 points in 38 AHL games — not to mention 59 penalty minutes — as a rookie pro last season, so the upside is evident. It’s tough to tell what Ritchie might be capable of — it’s anybody’s guess, really — but Perry and Getzlaf could potentially propel him to 15 goals and 30-some points. Ritchie is a sleeper all right, but it all depends where he slots into Anaheim’s lineup. Don’t give up on Ryan Getzlaf as a fantasy option. He actually bounced back in the second half of last season and should be productive again, providing he’s healthy. 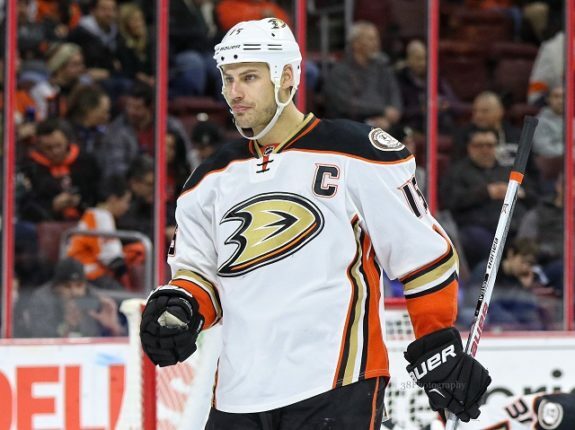 Getzlaf, the Ducks’ captain and Perry’s partner-in-crime, got off to a painfully slow start last season because he was in pain — eventually undergoing appendectomy surgery. Getzlaf came on strong in the second half and still wound up leading the team in scoring with 63 points in 77 games. However, his totals were down significantly from the previous two seasons, especially in the goal department. Getzlaf only scored 13 times last season after netting 25 and 31 goals in the same number of games. Like Perry, Getzlaf turned 31 years old in May — just a year younger than Kesler, who turns 32 at the end of this month — but Getzlaf’s playmaking ability should prolong his fantasy relevance for a couple more seasons. He may never top 80 points again, but Getzlaf should bounce back to score 20 goals and roughly 70 points. Take him around 30th too. Raymond is more of a wild-card. He’ll be competing with Ritchie for those prime gigs, alongside Getzlaf or more likely Kesler, but Raymond is coming off being bought out by his hometown Calgary Flames after last season. He spent part of that campaign in the minors and much of it in the press box, only posting four goals and five points in 29 games. And Raymond wasn’t much better the previous season either, tallying 12 goals and 23 points in 57 games. He’s far removed from his career-high 25-goal, 53-point season in 2009-10 on Kesler’s wing in Vancouver. You would have to be in a very deep league to even consider drafting Raymond, and best-case scenario is probably 15 goals and 35 points, but that would constitute quite the bounce-back. If Raymond starts the season on your waiver wire, he’s a guy worth keeping an eye on. Many predicted a breakout for Silfverberg last season and that didn’t happen, with the talented Swede matching his 39-point total from the previous campaign. He did score seven more goals, reaching 20 for the first time, but Silfverberg should be able to get to another level this season. To this point in his career, Silfverberg has been a better player in the postseason than the regular season — he’s been a point-per-game guy over the past two playoffs, with 23 points in 23 games. Silfverberg won’t be able to maintain that pace — he’ll never be an 82-point guy in the regular season — but he has the potential for 30 goals and 60 points as early as this season. He just turned 21 years old this month, but Theodore is ready for prime-time. 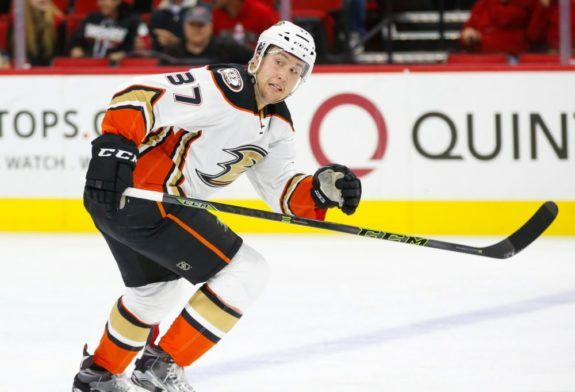 He got his feet wet with the Ducks as a rookie pro last season, impressing with three goals and eight points in 19 regular-season games before suiting up for six of Anaheim’s seven playoff contests. Theodore also produced nine goals and 37 points in 50 AHL games, showcasing his offensive potential and future fantasy value. Theodore is essentially a lock to crack Anaheim’s roster out of training camp and is expected to be an NHL regular this season. It wouldn’t be surprising to see him logging top-four minutes and getting power-play time by Christmas. Rookie defencemen are rarely owned in standard leagues, but Theodore is among the few that warrant consideration this season. If injuries strike Anaheim’s blue line, look for Brandon Montour to earn a call-up. He’s even more of an offensive catalyst than Theodore from the back end, with Montour having topped all rookies in finishing second among AHL defencemen with 57 points, including 12 goals, in 68 games for the San Diego Gulls. Montour will likely start this season in San Diego again, but Anaheim is almost certainly in his future and it could be sooner than later. Worth noting, Ritchie is no longer Calder eligible — the limit is 26 games and he played 33 last season — but Ritchie will still be considered a rookie by some fantasy standards and therefore would be the best of the bunch from Anaheim. 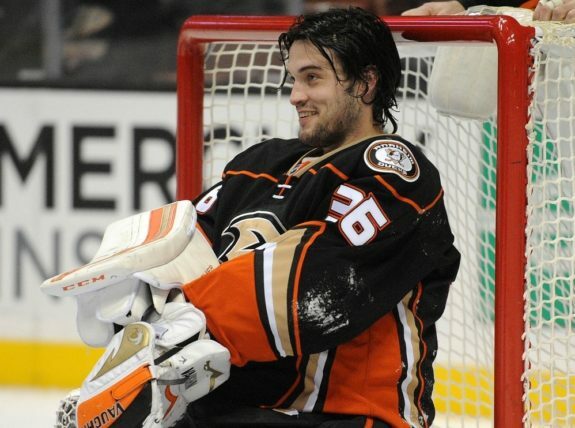 John Gibson has star potential, but can he live up to it in his first full season as Anaheim’s starting goalie? Time will tell. John Gibson is getting his chance to shine this season. With the Ducks trading away Frederik Andersen in the offseason, this team now belongs to Gibson. He has the pedigree to become a star goaltender and flashed his potential in making the all-rookie team last season, but there could be growing pains with Gibson as a first-year starter. Anaheim’s success, or lack thereof, will depend largely on the sophomore’s ability to be a consistent difference-maker. It worked for San Jose with Martin Jones and Gibson is believed to have the higher upside between those two, so if he can continue to live up to the hype, the Ducks could benefit in the form of another playoff berth or possibly even another division title. Gibson will be in the spotlight before training camp begins, as he’s slated to backstop Team North America in next month’s World Cup of Hockey. Gibson is the projected starter for that under-24 squad, which has the potential to surprise in the eight-team tournament. With Andersen’s trade to Toronto, Anaheim indirectly landed Jonathan Bernier as its new backup behind Gibson. Bernier came over in a separate transaction, but that deal was only delayed due to bonus money owed to Bernier, by Toronto, on July 1. Bernier will want to push for playing time and he previously played some of the best hockey of his career in California — as Jonathan Quick’s backup with the Los Angeles Kings (2010-2013) — but he’ll be counted on more as a veteran presence and a mentor for Gibson, who should see the lion’s share of the workload with 50-plus starts.